California’s drought is a preview of the latter half of the 21st century. Families picnic near the General Grant sequoia grove in Kings Canyon National Park. 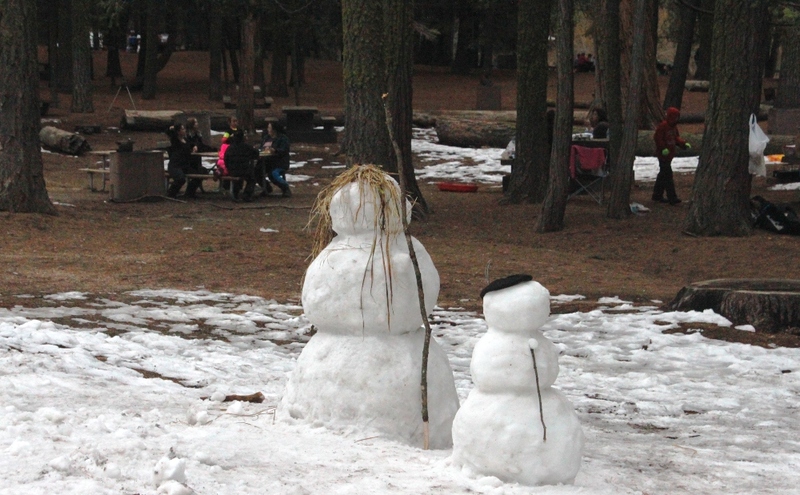 In a normal year the snow in this grove would cover the smaller snowman. Click image to enlarge. Panoramic Point in Kings Canyon National Park is a fine perch for surveying California’s drought crisis. From the 2,200-meter (7,200-foot) promontory, the southern half of the Central Valley spreads westward, flat and fertile, until the sod bumps against the foothills of the Coast Range, a two-hour drive away. A layer of smog the color of laundry water hangs low and tight in the bowl of the valley, home to some of the worst air pollution in the nation. Pivoting 180 degrees, I peer deep into the Sierra Nevada, all granite and conifers and echoes of John Muir. I can see these things clearly – naturalist Scotsman excepted – because of what is not on the ground: snow. In a normal winter I would have used snowshoes and trekking poles to climb to Panoramic Point. Yesterday I ran to the top – in shorts and a T-shirt. The temperature was 61 degrees, in mid-February. Roads and trails usually covered in feet of snow are naked. The few snowy patches measure only inches. The California Department of Water Resources monitors the state’s snowfall. In the southern Sierra Nevada, where I stand, official statistics reckon that the amount of snow in the mountains is 25 percent of normal. The reality of that 25-percent figure isn’t truly clear until I see families picnicking in a meadow where snow should be hip high. 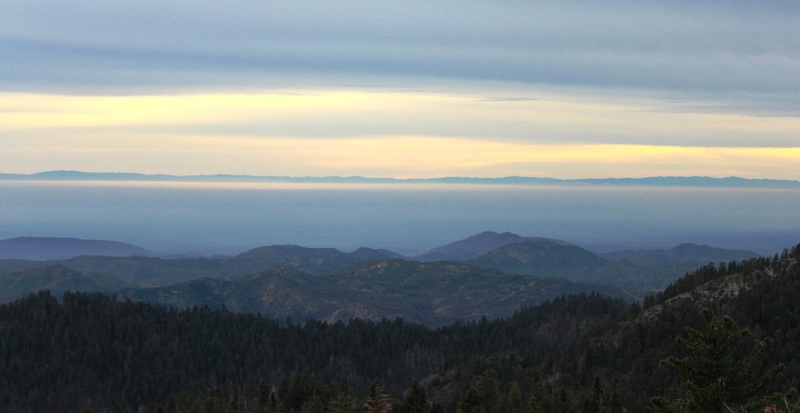 A layer of smog fills the Central Valley, an agricultural cornucopia located between the Sierra Nevada and the Coast Range. Click image to enlarge. The absence of snow is exceptional today, but it will soon be commonplace. Unless global carbon emissions are reined in – and they continue to rise – snowpack in California will drop sharply by the end of the century. Climate scientists are not sure whether total precipitation will increase or decrease, but the amount that falls as snow will most likely plummet, by at least 32 percent in the rosiest scenario and as much as 90 percent in the worst. The changes in hydrology – changes to when precipitation falls, in what form, and to how much evaporates before entering a river – require comprehensive changes in how water is managed in the state. The snow acts as a natural reservoir, releasing supplies slowly through the spring and early summer. In the coming decades, farmers, cities, and those who look after fish and forests will not have a deep and reliable snow reserve. As the state withers, officials debate what to do. More storage is one option, both in surface reservoirs and in aquifers, where the water cannot evaporate. Aquifers are already an essential water supply, even more so in this historic drought. Farmers, who account for 80 percent of the state’s water use, are pumping more groundwater to survive a year in which they might not get any water from rivers. Groundwater, of course, is one thing I cannot see from my perch on Panoramic Point. But aquifers, too, are in crisis. Farmers pump out more water each year than soaks into the ground. If visible, the condition of the aquifers would be nearly as shocking as the snow puddles at my feet. Here is a scenario that I’ve been waiting to play out… California, thankfully, receives an abundant snow pack after years of thin reserves. Whew, we all sigh. Then, on April 1st, we get a warm rain, a big one, one that melts the snowpack away. And, instead of having the infrastructure in place to catch the massive runoff, we watch it reek havoc until lost at sea… Oops.